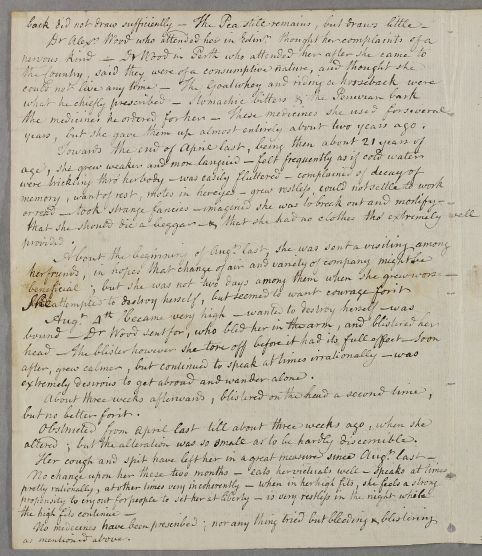 Letter from Colin Baxter to Alexander MacDuff, concerning the case of Janet Macduff, Baxter's sister-law and MacDuff's sister. The first two pages, also written by Baxter, contain a report of Janet MacDuff's condition to be passed on to Cullen. Baxter asks MacDuff to get advice from Cullen in writing, as he does not trust Dr W(ood) to faithfully follow Cullen's prescriptions in the depth of Winter. 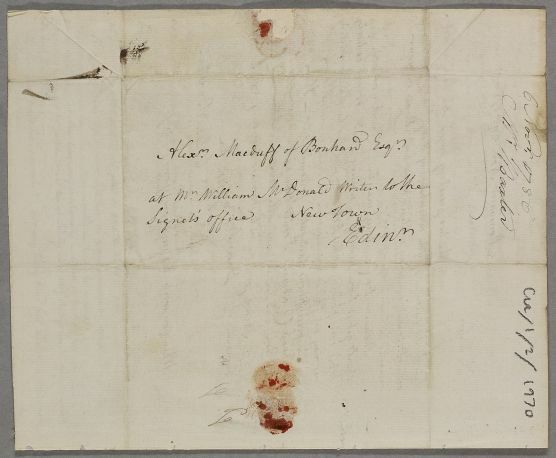 The annotated date added on final page (6 Nov 1786) seems to be incorrect as Baxter dates his letter 29 Nov 1786. 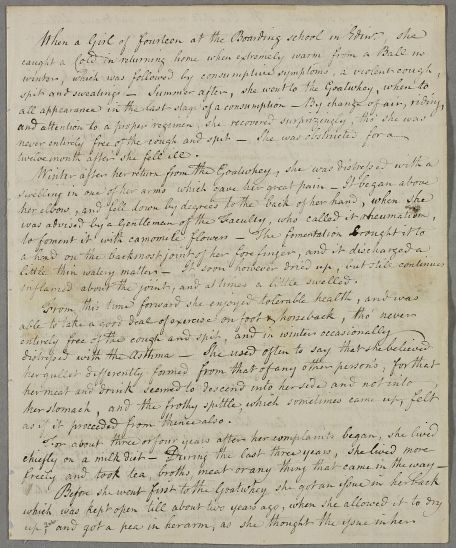 Summary Letter from Colin Baxter to Alexander MacDuff, concerning the case of Janet Macduff, Baxter's sister-law and MacDuff's sister. The first two pages, also written by Baxter, contain a report of Janet MacDuff's condition to be passed on to Cullen. Baxter asks MacDuff to get advice from Cullen in writing, as he does not trust Dr W(ood) to faithfully follow Cullen's prescriptions in the depth of Winter. 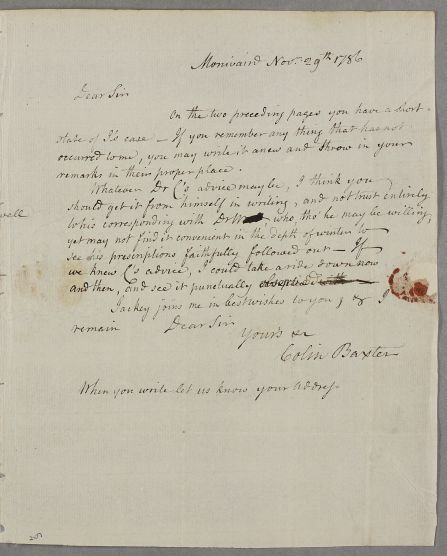 The annotated date added on final page (6 Nov 1786) seems to be incorrect as Baxter dates his letter 29 Nov 1786. Case of Miss MacDuff: complex set of letters relating to the Macduff family. twelve month after she fell ill.
inflamed about the joint, and at times a little swelled. as if it proceeded from thence also. years, but gave them up almost entirely about two years ago. extremely desirous to get abroad and wander alone. but no better for it. altered; but the alteration was so small as to be hardly discernible. remarks in their proper place. Alexr. Macduff of Bonhard Esqr.